The World Cup is back, which means heart-stopping whistles, grown men crying and an inexplicable patriotism you never seem to notice until the event is underway. Whether you’re hoarse from cheering, need a tipple to calm your nerves or simply find alcohol improves your enthusiasm for sports, the world’s liquor cabinet is bursting with cocktail options to help you celebrate. Combining the magical technique of world-class sportsmen with a sense of national pride, the World Cup is a recipe for sweat, tears and elation. Over the decades, the football tournament has brought us all number of headlines and water cooler gossip. From scandals that have shaken the planet like Maradona’s infamous teamwork with God to bizarre and beautiful goal celebrations like the robot and the worm… And let’s not forget that time England actually won. Once every four years it seems football has the power to enchant the whole world (and leave us all in need of a stiff drink). Though eleven men and a ball can get heartbeats racing and draw passionate fans to their knees, many guests at World Cup parties will be less than enthused by the fluttering flags and blaring horns. 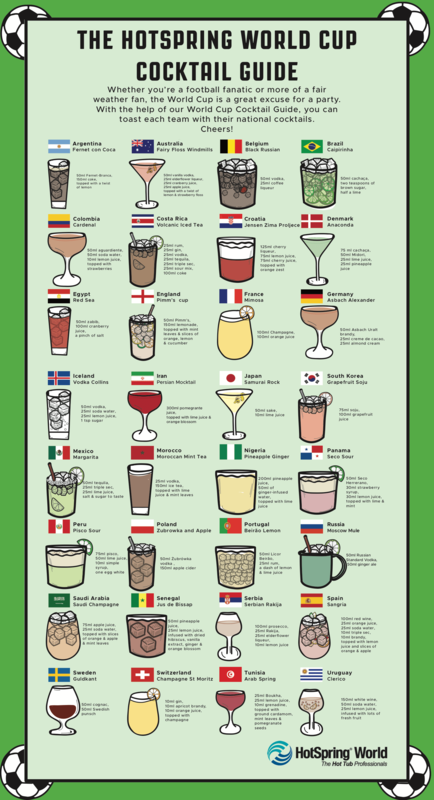 But with the help of our guide to World Cup cocktails, inspired by the most popular cocktails from every country playing, suddenly even those indifferent to the offside rule will be feeling the tingle of World Cup fever. If nothing else, it’s a cracking excuse for a party. Football is generally enjoyed with a chorus of vindaloo, lots of shouting and several gallons of lager. But a bar (or a kitchen) equipped to mix the world’s best cocktails brings a fancier touch to the whole affair. For every match, mix up a batch of the two competing countries’ cocktails and get cheering! Certain teams have shone brighter than others throughout the World Cup’s history, meaning as the tournament progresses you’re likely to end up sipping more of the national cocktails from countries like Italy, France, Brazil, Germany and Spain. A tangy Caipirinha will transport you straight from a stale-smelling sports bar or a cloudy back garden to a deserted Brazilian beach – just be prepared for the roar of the crowd dragging you back to reality when somebody scores. Argentina too is rightly proud of its incredible footballing history. Let the ‘Hand of God’ touch your cocktail shaker this World Cup with a delicious Fernet con Coca, which contains the pungent spirit Fernet-Branca mixed with coke and topped with lemon. When France are playing, enjoy the match from the comfort of your hot tub and pair bubbles with bubbles with the help of a mimosa. With the sharp tang of fruit juice paired with the sparkling glamour of champagne, the referee’s whistle becomes practically birdsong. If you’re neutral enough not to weep when your country’s boys are knocked out spectacularly in the first round, you’ll be able to appreciate the glory of a more obscure team free-kicking its way to unexpected victory. South Korea may not be famous for their ball-skills but in recent years the country has produced magnificent players like Lee Seung-Woo (apparently he’s Korea’s answer to Messi). Perhaps you’re attending the match against your will, but with a Grapefruit Soju in hand, you’ll suddenly find yourself chanting with the crowd as these hopeful underdogs tackle the competition. One of the most popular cocktails in Iceland – a Vodka Collins – will help you celebrate the Nordic team’s surprise victory, or drown your sorrows when they’re beaten by one of the big names. Iran too could score a shock win, and a delicious (booze free) Persian Mocktail with pomegranate and orange blossom is a fruity way to support the team and keep your cool if extra time gets emotional. Behind the booing, the fouls, the hooligans and missed penalties, the World Cup is a colourful international celebration that deserves a spot on your calendar. Avoid the hoards of fans elbowing their way to the big screen and invite your favourites round to sample a world class cocktail menu. And get the hot tub bubbling for added fabulous! With the chance to sample the most popular cocktails from their own countries and across the globe, your football-fan friends can quench their thirst in style. Those nonplussed by over-dramatic injury faces and lacklustre football anthems will be more than impressed as you serve them the best cocktails in the world. Score.